I have been lucky in obtaining literature about the OSI. I've already collected the original owners manual, the inspections book, the colors and trim catalogue, the spare parts catalogue and some sales brochures. I have several books and magazines with a lot of information in several languages like German, French, Italian, English and Portuguese from 1966 until today. I will be publishing all the things I have, more than one hundred articles by now. In the next weeks, all the stuff I have will be here. All the pages will be scanned and readable. You can't miss this. It's being a lot of work but it worth it. I am sorry to take so long to finish this job but it breaks my heart to open some magazines and probably break its spine. Good news! Finally a book about Sergio Sartorelli. It was launched during the Automotoreretro last February, 8 in Turin. Written by Giuliano Silli and Published by ASI. Text in Italian and English, 176 pages. From the publisher: "The life and the complete production of Sergio Sartorelli, the great designer who worked with Ghia, Osi and for many years in the Fiat Style Centre. 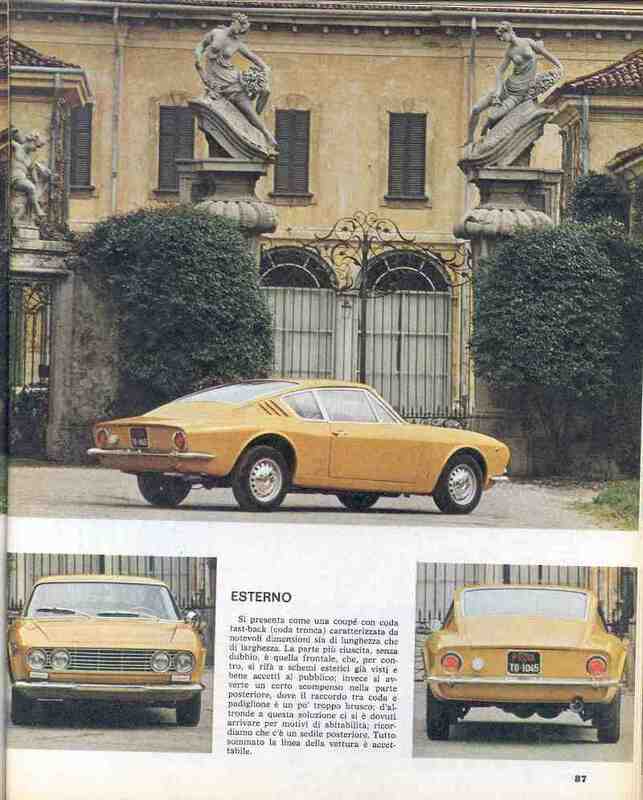 He was the father of Karmann Ghia, Fiat Ritmo, Fiat 126 and lots of other studies and prototypes." Just got mine, just beautiful. But beside the drawings, there is nothing really new. I expected more about the man, like what cars was Ing. Sartorelli driving during his life for example. There is still a lot to know about OSI and Sartorelli. It will be scanned and printable. I hope there is no problems with copyrights or something. It was not from my car, it was from the EX54GE01615. I wonder where is this car. It was owned by Mr. Franz Borchard of Bielefeld, as handwritten in the inner cover. The first inspection was in July, 17 1967, with only 20 Km and the last reported was in March, 27 1974, after 65.477 Km, allways in Erdmann & Domke in Bielefeld who also sold the car. This is a OSI owner must. It's a 1967/1968 Ford Werke AG. edition and it's serial number is 10156. I don't know if Ford still supply it. Anyway, there are 112 pages of precious information. 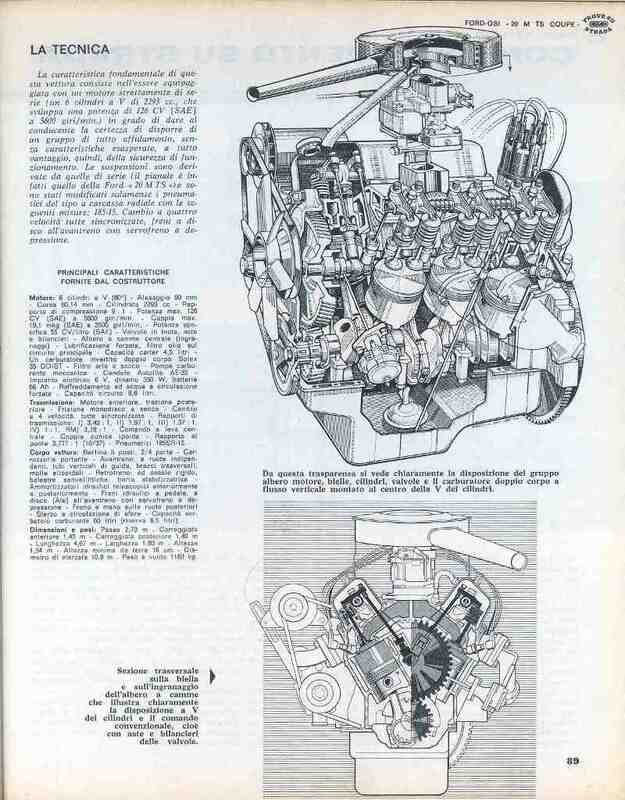 It is very interesting to note that dozens of modifications were made during the OSI production. The parts catalogue lists this modifications from the VIN numbers. Apparently the transition from 6 to 12 Volts occured from the VIN 1877 to 1878 and the P5 based cars finished in the VIN 2080. So if your OSI is 2081 or up it is a P7 based car. You can download it here. Later, I will improve the quality. Beware because it is almost 54 Megabytes long. I have the German and the Italian version. Nice item. Beside the body colors, there is also an array of the possible deliverable leather/fabric combinations. Click on the icon bellow the picture to see the other pages. This contains real samples of paint and because it has never been exposed to sun, it remains as accurate as possible. The the dark yellow paint for my car was tuned using this color chart. 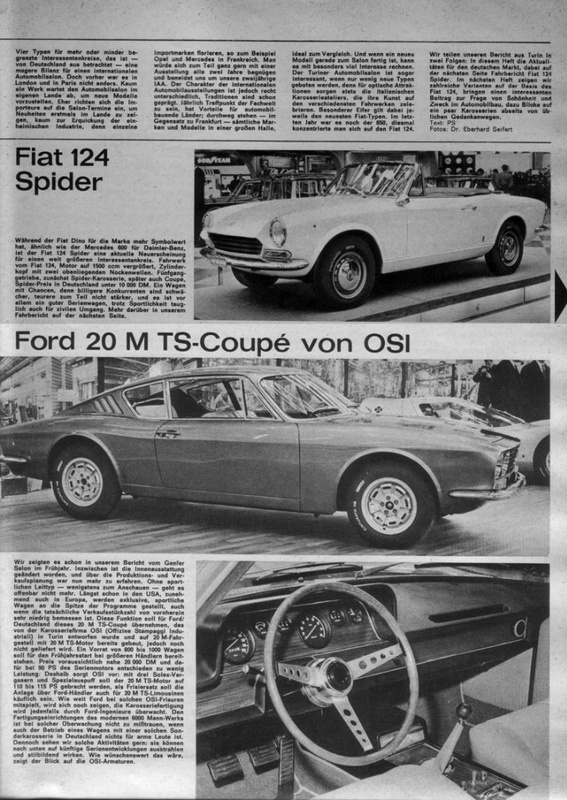 This article also reports the OSI launch in the German market in January 10, 1967 in the Schloss Georghausen palace near Cologne. It starts with "While VOLKSWAGEN announces a savings model with 300 DM deduction, Ford presented a luxury model with 6000 DM surcharge." In the picture, together with the car you can see one of the models, which "probably froze terribly despite the wool dress". 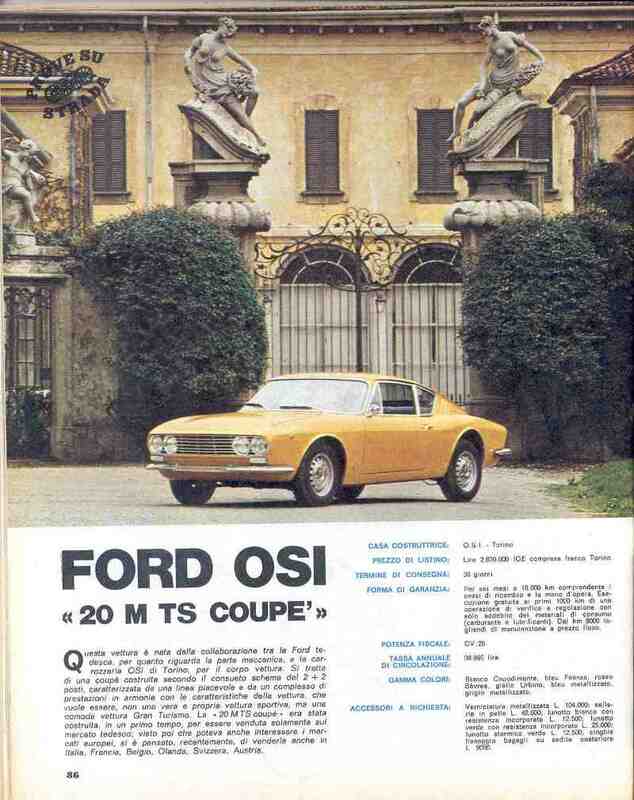 Pictures of the OSI 20m TS, the ford 20m TS coupé and the Mustang. 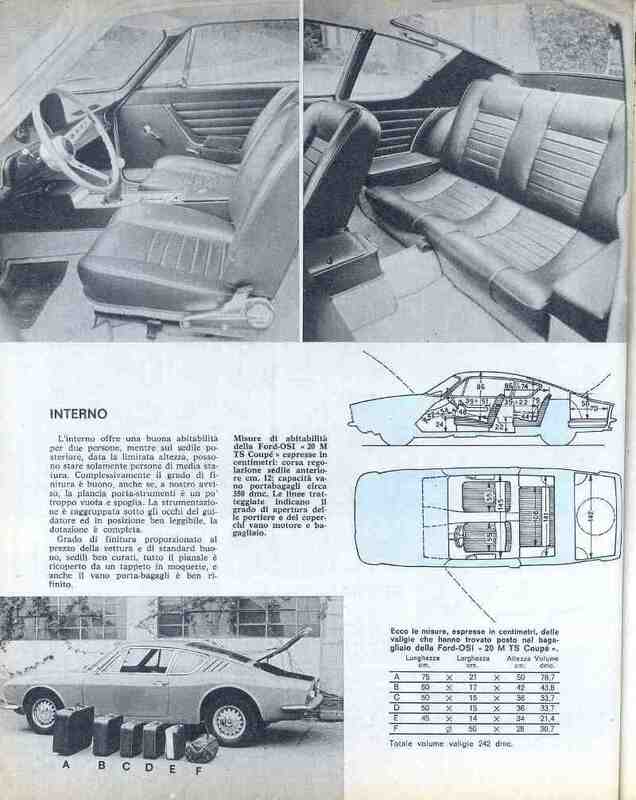 Italian - "At the steering wheel of the Geneva novelties" (but wasn't OSI 20m TS a novelty in the former year?). In this small article, there is what seems to be a honest review of the car. They think the front pillar is too thick which reduces visibility and the mirror is not very efficient. 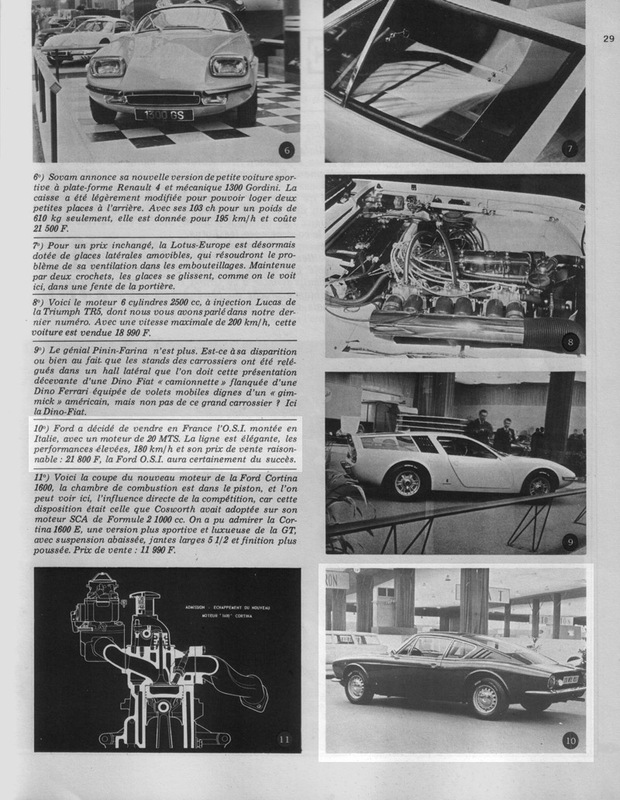 This is one of many magazines not about cars with OSI 20m TS articles. The OSI was presented in Germany in January 10, 1967 in a grand ceremony, with the presence of OSI's general director, Dr. Ing. Giacomo Bianco and 7 units of the 20m TS as well as some very pretty models in a fashion parade. This event will be described in the history section very soon. 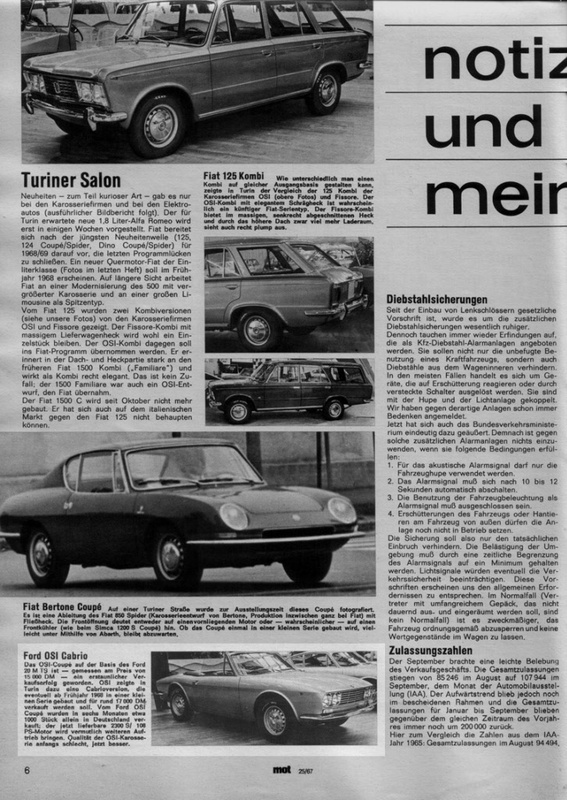 Bellow the article inserted picture you can read that one thousand cars were ordered during the dealers presentation (a secret event in Cologne presented only to some selected dealers). As a curiosity, there were 400 orders during the Paris motor show exhibition. In a section called "News of the [Paris] Salon", we can read "Ford decided to sell the O.S.I. in France, assembled in Italy with an 20m TS engine. The style is elegant, the performances are high, 180 Km/h and the price reasonable: 21.800 Francs. The Ford O.S.I. will surelly be a success." 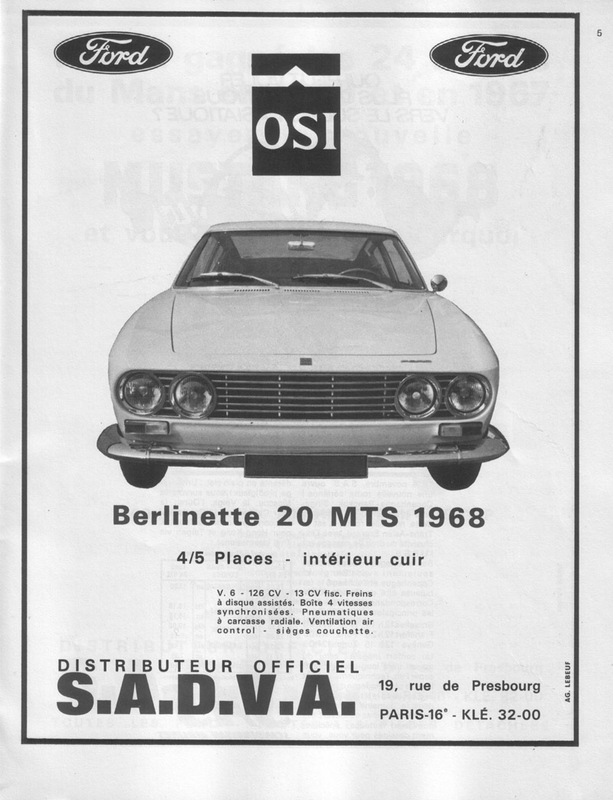 Aditionally, there is a full page ad of the official France seller with a OSI 20m TS picture. There is a Ford emblem on the front left of the car that I've seen before on Jan Peters car, the EX54HB02771, check the image of the front. It would be interesting to know what cars had the Ford emblem, maybe just this importer? German - The OSI in the 1966 Turin show. It was presented in the OSI stand, not in Ford's like Geneva earlier in March. The wheels are non standard alloy. The Alfa Romeo OSI Scarabeo is next to it. Italian text. 6 full pages.